• Produce special effects like meat noodles, meat and vegetable pastas (using gelatin as a binder), etc. Additionally, TG can thicken egg yolks, strengthen dough mixtures, thicken dairy systems, and increase yield in tofu production, among other useful applications. This primer is aimed at giving the basics of meat glue—not recipes. Individual recipes abound on our blog and the net. TG is a naturally occurring enzyme in plants, animals, and bacteria. Enzymes are proteins that act as catalysts in chemical reactions; they speed up reactions and make reactions occur that otherwise wouldn’t. Although TG is a newcomer to the kitchen, cooks have used enzymes for thousands of years. Enzymes in papaya, for instance, are traditionally used as meat tenderizers. The enzyme rennet is used to curdle milk when making cheese. Enzymes that break down starches into sugar are used to brew beer. Naturally occurring enzymes in meat tenderize dry-aged steaks and give cured meats their distinctive flavors. Enzymes are the reason fresh pineapples hurt your mouth. They also keep gelatin from setting. TG bonds protein molecules together with a very strong (covalent) bond by linking two amino acids: glutamine and lysine (for exactly what goes on see A Note on Proteins). TG was first identified in 1959 and isolated for testing and research in the 1960’s. Guinea pig liver provided the first commercially available form of TG. Though researched for food applications, TG was not widely used at the time because it was expensive, difficult to refine, and required calcium to work. In 1989, after testing over five thousands strains of microbes, researchers at the Japanese company Ajinomoto (best known for the production of MSG) discovered a strain of soil bacteria, Streptoverticillium mobaraense, which produced large quantities of easily purified TG. This TG is called microbial TG, or mTG. Besides being easy to produce, mTG does not require calcium and is very easy to use. With meat glue you can glue any protein to any protein. Great, right? Well, just because you can do it, doesn’t mean you should. 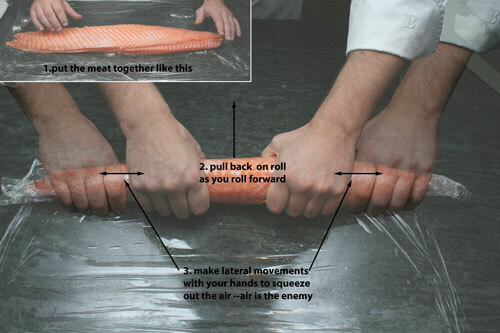 Gluing salmon to salmon is a very good idea. You get a piece of fish that is uniform; looks the same, cooks the same. 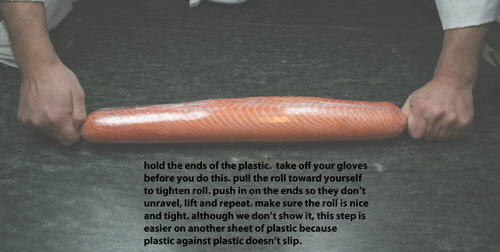 Gluing chicken to salmon is not such a great idea because they have different textures and different cooking temperatures. The salmon will be dead before the chicken is cooked. Gluing chicken skin to salmon works quite well though, and will actually protect the outside of the salmon from overcooking. The other thing to take in consideration is how many pieces of meat you are fusing together. Some people try to make the case that you can use all the small pieces you have left over from fabricating to make a whole muscle cut. For example, the trimmings from tenderloin can be glued together to make a couple of extra portions –but they aren’t fillet mignon steaks. Bad idea. With too many small pieces, the meat will just look “Frankensteined.” Also, the texture will be completely different than a piece made from two or three (maximum) pieces. TG is safe. It will not harm you or glue your hands together. TG is deactivated by most cooking techniques and imparts no off-flavors to foods. (There is some debate about off-flavors. Read the next section, Long, Long Story.) TG is delivered as a powder and, like all powders, should not be inhaled. TG should not be consumed directly in large quantities, but consuming active TG in the levels recommended for food usage is harmless. TG is classified by the FDA as a GRAS product (generally recognized as safe) when used properly. Although some studies have shown that stomach enzymes have difficulty breaking down proteins after they have been bonded by TG, other studies have shown that these bonded proteins are absorbed and broken down in the body into normal products as though they had never been bonded. Normally, we detect no off-flavors in products bonded with TG. Bruno Goussault and Cuisine Solutions proposed that they could detect off flavors in long-cooked vacuum-packed beef products. We didn’t believe them so we tested it out. Turns out that a certain portion of the population can detect an off-flavor in short ribs that have been coated in excessive amounts of TG (Activa RM type) and cooked for 48 hours in a vacuum bag when tasted blind next to a control. If a moderate amount of meat glue is used fewer people can pick anything out, and if a light amount of meat glue is used, people detect an off-flavor in the control as often as the one with TG. What is the reason for this? We aren’t sure. We have two hypotheses. The casein in Activa RM is causing the-off flavors (we are getting some Activa TI to conduct our own test). Or the enzyme itself is causing the off-flavors, either through the ammonia released during the reaction (maybe it can’t escape the vacuum bag? See our section on testing meat glue) or through some other reaction. The only other time I detected an off-flavor was in a raw fish product that had been heavily meat glued and vacuum bagged. That time I knew the culprit: the ammonia from the reaction itself. I lowered the amount of meat glue and cut the bag open to allow the product to air out before serving and had no further issues. We have nothing more to say than what we said before: Although some studies have shown that stomach enzymes have difficulty breaking down proteins after they have been bonded by TG*, other studies have shown that these bonded proteins are absorbed and broken down in the body into normal products as though they had never been bonded**. In any event, even if the bonded proteins weren’t as bio-available as the native proteins, the actual percent of amino acids no longer available to the human body after digestion would only be a small portion of the total in the food. *Influence of Transglutaminase-Induced Cross-Linking on In Vitro Digestability of Soy Protein Isolate, Chuan-He Tang, et al., Journal of Food Biochemistry 30 (2006), 718-731. ** The Epsilon(Gamma-Glutamyl)-Lysine moiety in cross linked casein is an available source of Lysine for Rats, K Seguro, et al., J. Nutr., 126 (1996), 2557-2562. We haven’t read this study. There are many types of TG, including several in the human body. TG-ases play a vital and necessary role in skin synthesis, blood clotting, the immune response, etc. You wouldn’t exist without them. When TG-ases are improperly regulated in the body, they are associated with very bad things like the plaques in the brains of Alzheimer’s, Parkinson’s, and Huntington’s disease patients as well as in the development of cataracts in the eyes, arteriosclerosis (hardening of the arteries), various skin disorders, etc*. None of these are related to eating food made with mTG, but rather due to imbalances in the body’s ability to regulate the TG that it produces. *Transglutaminases in Disease, Soo-Youl Kim, et al., Neurochemistry International 40 (2002), 85-103. The main threats theoretically posed by TG are that it is itself harmful or that the new proteins it creates are harmful. We’ll address each part separately. Once mTG has been denatured it is a protein like any other that gets broken down in the digestive tract like any other. mTG is inactivated by heat. After 10 minutes at 60°C, 94% of mTG is denatured. mTG is eventually denatured even at 55°C. If you eat active mTG, it is inactivated by the low pH of your stomach and is broken down in under a minute by pepsin, one of your digestive enzymes. The only real hazards of ingesting active mTG therefore would occur in your mouth and esophagus. 1.) Transglutaminase occurs naturally as has always been eaten to a certain degree. 2.) Rats fed large doses of Transglutaminase didn’t die or show any acute pathological problems. 3.) Different cell cultures that were tested for cell mutations using Transglutaminase showed no mutagenic effects. This test was to show that TG isn’t detrimental in the long term (Acute Toxicity and Genotoxicity Studies of a Microbial Transglutaminase, BK Bernard, et al, International Journal of Toxicology 1998. This study was paid for by Ajinomoto). Ajjinomoto’s arguments have 3 holes in them that I can see. First, the argument that we have been eating TG for a long time is only partly true. We have been eating a different form of TG for a long time. MTG is a different enzyme from the one found in animal and plant tissue. MTG doesn’t require calcium, binds more types of proteins, etc. Second, their study involves force feeding rats via a stomach tube. Once the enzyme is in the stomach it is quickly inactivated and destroyed. They don’t have any data on the acute effects of large doses of active mTG on the mouth, tongue and esophagus (that I can see). Third, I’d like to see a long-term study of the effects of chronic ingestion of active mTG on an animal’s system. I wasn’t able to find any studies where rats were fed a ton of TG for 2 years and examined (I’m not saying these studies don’t exist). Even given those caveats, we are confident of the safety of TG itself. We have been eating it for years. Are the new proteins that TG makes harmful? The main hazard of creating novel proteins is their effect as a potential allergen. While TG itself is non-allergenic, there are studies that show that gluten can be made more allergenic if treated with TG. Gluten-free cereal products can contain a small amount of gluten. That small amount is below the threshold of activity for Celiac patients. If that small amount of gluten is made more allergenic by TG, there is the possibility that a “Gluten Free” product could suddenly pose a hazard*. Interestingly, there are other studies that claim that if gluten is reacted with mTG under the right circumstances, it can be rendered safe for consumption by Celiac sufferers**. *(Microbial Transglutaminases Generate T Cell Stimulatory Epitopes Involved in Celiac Disease, E.H.A. Dekking, et al, Journal of Cereal Science 47 (2008), 339-346. **Transamidation of Wheat Flour Inhibits the Response to Gliadin of Intestinal T Cells in Celiac Disease, Carmen Gianfrani, et al. Gastroenterology 133 (2007), 780-789. 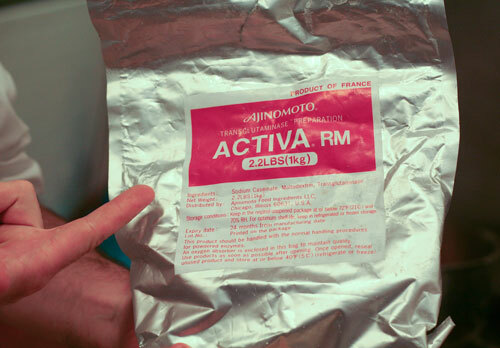 Activa RM:Most chefs use RM, which is designed to bond even problem foods like chicken breasts and cooked meats. RM is a mixture of TG, maltodextrin, and the helper protein sodium caseinate. Sodium caseinate is a water soluble protein derived from milk, and TG bonds it extremely well. The caseinate in Activa RM fills in the gaps between the pieces being glued, making up for any lack of available protein in the food itself. RM can be sprinkled on like a powder, mixed with 4 times its weight in water to make a slurry, or added directly into meat mixtures. Even if a recipe doesn’t require the extra bonding insurance caseinate provides, there is no disadvantage to having it mixed with the TG. For most applications, RM is the only TG you will ever need. Activa GB: GB (“greatest bond”) is a mixture of TG, maltodextrin, gelatin, and an anti-caking agent. Gelatin is bonded extremely well by TG and therefore Activa GB forms strong bonds. It is not as versatile as RM because it cannot be made into a slurry, it is more sensitive to water, and it has a shorter working time. If you need a stronger bond, GB is useful. Activa GS: GS is the newest addition to the Activa line. It is nice because it can be left out on the counter all day without going bad. Like GB, it is a mixture of TG, maltodextrin, and gelatin, with added polyphosphate salts and a little oil. It is always used in the form of a slurry of 4 parts water to one part Activa GS. The polyphosphates make the slurry alkaline (basic, high pH). The enzyme is inactive at high pH, so the slurry is stable all day. Once the slurry is painted on meat, the pH drops, the enzymes become active, and gluing begins. Activa TI and TIU:TI is simply TG and maltodextrin with no added helper protein. TIU is the Kosher version of TI and is the only Kosher TG available. TI is packaged at twice the enzyme level as RM or GB. It can be sprinkled or made into a slurry. It will not bond as wide a range of foods as RM. Activa YG:YG a mixture of TG, lactose, maltodextrin, yeast extract, and safflower oil. It is designed to thicken and improve the texture of dairy systems like yogurt and cheese. Activa FP:FP is similar to RM but contains skim milk powder, which is friendlier on a nutrition label than caseinate (the useful part of skim milk powder). FP is useful for marketing a product that has an ingredients declaration. Ajinomoto ships Activa products in vacuum sealed foil pouches. Unopened, these pouches are good for 18 months if stored below 21°C (72°F). Once open, however, the enzymes become vulnerable to moisture. Opened pouches should be tightly wrapped and stored in the freezer. The freezing temperatures will not hurt the enzyme and the low humidity in the freezer will prevent degradation. Never leave large quantities of TG out on the counter, especially in open containers—they will quickly become garbage. Remove only the amount needed using clean, dry utensils and return the rest to the freezer. Keep the working container closed when not in use. A vacuum sealer is useful for breaking a batch of TG into small packages for sealed storage in the freezer. How to test meat glue: a) Rub a lot of meat glue into a piece of raw chicken; b) if it just smells like chicken your glue is no good; c) If it smells like wet dog you're good to go! There is a way to test if your meat glue is still working. Get a small scrap of raw meat (we use chicken). Apply a liberal amount of meat glue to the meat and massage it in. Sniff the meat (don’t inhale the powder). If the meat smells like a wet dog or a wet wool sweater, your glue is good. If it doesn’t, your glue is bad. The next time you get a fresh shipment of TG, run the “wet dog” again and get a sense for how strong the smell is. After a while you will be able to tell how good your glue is (how high the enzymatic activity is) by how strong the wet dog smell is. Don’t wait too long to sniff after you massage in the glue because the smell dissipates after a couple of minutes. The wet dog smell is, I believe, caused by the small amount of ammonia released in the TG reaction. With one notable exception (see the above section on Safety Nutrition and Taste), I have never detected this smell in a finished product. The ammonia dissipates before you eat the product. Salt has an interesting effect on meats when combined with TG. Salting meat makes more of its proteins soluble and allows the meat to bind together naturally, as in a traditional sausage: Meat and salt are mixed together, the salt forces some of the meat’s protein into solution, and this protein forms a gel that binds the sausage together. In charcuterie this is called the primary bind. Because these soluble proteins are an excellent bonding substrate for TG, salting meat can dramatically increase bond strength. In many recipes, however, the combination of TG and salt can make food rubbery. Fix this problem by reducing the levels of salt or of TG. TG depends on available proteins to do its job. Much of the protein on the surface of charred and seared meats is unavailable to TG for bonding. The Maillard reaction uses them up. The cooked portions of meats may or may not have the majority of its protein available. Typically, cooked meats will still glue together, but they do not bond as strongly as their raw counterparts. The added sodium caseinate in Activa RM (as opposed to Active TI) helps to overcome the lack of undisturbed proteins in cooked and cured meats. Bacon and ham can be glued, as can braised short ribs and other similar foods. High fat items, like chicken skin and bacon, can be glued because of the connective tissue they contain. Rendered fat cannot be glued. Every chef knows not to fill a turkey with warm stuffing and put it in the refrigerator. Bacteria can multiply in the warm environment and produce dangerous toxins before the assembly gets cold enough to prevent such growth. TG presents the same kind of contamination risk. Do not glue warm food inside a product that will be stored. From a bacteriological safety standpoint, re-structured meats should be treated like traditional ground meat. When cooking rare, treat food like it will be consumed raw, as in a tartare. Rare cooking is acceptable on whole muscle cuts because the amount of bacteria found on the inside of muscles is low. Gluing meat puts the outside (with lots of bacteria) on the inside, so glued foods must be fresh and have a low bacteria count. Activa RM is usually sprinkled over the pieces of meat to be bonded. Sprinkle enough RM on both surfaces to form a complete dusting; even out the coating with a brush. Alternatively, dip the pieces directly into the RM. 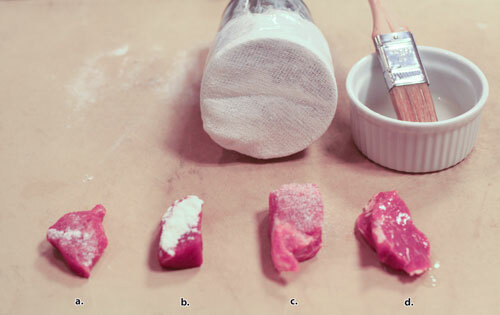 RM can also be mixed with 4 parts by weight of water to form a slurry to paint on the meat. Don’t mix more slurry than will be used within 20 minutes, and discard the slurry after 30 minutes—the bonding power degrades over time because the caseinate in the RM will bonds to itself. When bonding a mixture, add RM by weight. Typically, RM is used at .75% to 1% by weight of the mixture being bonded. 1 kilogram of mixture will require 10 grams of RM. The exception is pure chicken breast, which is more difficult to bond and sometimes requires up to 2%. Leg meat will work at 1%. Adding water or water-based flavors (like wine) to mixtures in small quantities does not affect bond strength, but adding fat-based flavors (like cream) will weaken the bond. After adding TG, remove any air pockets between the two bonding surfaces. Vacuum pack food items to assure a tight seal, if the food and local regulations allow. For shapes like rolls and sausages, simply roll the products in plastic wrap. 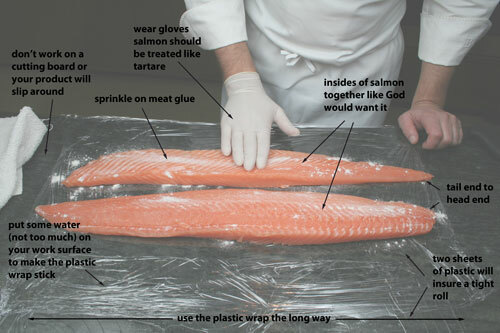 The plastic wrap technique is great because there are no rules regulating its use, and it is simple, fast and cheap; foods can be cooked in water directly in the plastic wrap. Putting a weight on top of pieces to be glued is also a good technique. Try to get all gluing and forming done within 20-30 minutes and then allow the product to remain undisturbed in the refrigerator for 4 hours or more, unless you are using the heat-set method. TG will bond within 3 hours but bond strength will be substantially higher after 4 or 5 hours at refrigeration temperatures. Highly acidic environments (below pH 4) cannot be glued effectively. To make a TG ceviche, glue the seafood together before marinating in acid. Most other marinades, however, won’t lower the pH of the proteins enough to inhibit bonding, allowing for post-marinade gluing. TG, like most enzymes, increases its activity as the temperature is raised—to a point. The same bonding reaction that takes 4 hours in the refrigerator takes place in just 5-20 minutes at 50-58°C (122- 136°F). This technique is called heat setting. Typically we will place items to be heat set in a 55°C water bath. 5 minutes after the core has reached temperature the meat is bonded. If Nils had his way every animal in the world would grow in the shape of a tube. Tubes are great. Tubes cook more evenly and have less waste than other shapes. They can be cut into attractive and identical portions. TG gives a chef the ability to take odd meat shapes and make them into perfect tubes (or other shapes), producing consistently sized and shaped portions with minimum waste. Sides of fish and beef tenderloins are notoriously difficult to use fully because of the thin tail sections. Here is how Nils rolls them. Pay attention because his technique is pretty good and it’s not as easy as it looks. Enzymes are proteins, and proteins are made up of building blocks called amino acids. Amino acids are small molecules that have three groups bonded to a central carbon atom—an amino group (meaning contains nitrogen), an organic acid group (COOH), and a side chain (usually referred to as the R group). There are 20 aminos that regularly occur in proteins and they are all the same except for the R group. It is the difference between R groups that give each amino acid its special characteristics. Some have a positive charge, some have a negative charge; some are bigger, some are smaller; some like water (hydrophilic) and some don’t (hydrophobic). All amino acids have the ability to be linked together by joining the acid group of one to the amino group of another. This link is called a peptide bond. TG does not form peptide bonds. TG bonds the R group of the amino acid glutamine to the R group of the amino acid lysine. Proteins are long chains of amino acids containing from a couple of hundred to several thousand units. The function of a protein is determined by its shape and the distribution of charge and hydrophilic and hydrophobic areas in that shape. These are determined by the order of the protein’s amino acids and the environment. Heating proteins makes them jiggle more violently, eventually disrupting their shape—the protein has been heat-denatured. Some denaturation is reversible and some, like cooking an egg white is not. PH (acidity and alkalinity) also changes the shape and function of proteins by altering the charge on the individual amino acids. This is why milk curdles when you add acid. Whipping and kneading can also change the shape and function of proteins—the unfolding of proteins in whipped egg whites allows us to make angel food cake. In any enzyme reaction there is the substrate, which is what the enzyme reacts with, and the product, which is what the enzyme makes. The special shape of each enzyme determines what substrate(s) it will bind. It is a small section of the enzyme, called the active site, which actually does the work of catalyzing reactions. Enzyme function is often described using the lock and key model. The substrates fit like a key into the active site of the enzyme (the lock). When the enzyme is binding with its substrates the very specific geometry of the active site as well as distribution of charge and the placement of hydrophilic and hydrophobic groups within the active site allow reactions to occur very efficiently. If shape 24 of the enzyme is disrupted by heat, incorrect pH, etc, it ceases to function properly. It is important to know the heat and acid tolerance of a given enzyme when using it in the kitchen. The speed of an enzyme reaction had many factors, including the inherent efficiency of the enzyme, the concentration of enzyme and substrate, the presence of inhibitors, and the temperature. As temperature rises, two things happen: first, molecules are more energetic, increasing the amount of available energy they have to react, and secondly, because molecules move faster when they are heated, they tend to collide more frequently, giving more chances for reactions to occur. In general, enzyme reactions will speed up as temperature increases until the enzyme is denatured. The heat denaturing of an enzyme is time and temperature dependant. Enzymes are typically stable up to a given temperature, which for TG is around 40°C (104°F), above which the enzyme is slowly inactivated. As temperature is increased, inactivation becomes faster and faster. Although is takes many hours to inactivate TG at 45°C (104°F), 10 minutes at 60°(104°F) will destroy 94% of TG. If meat paste is extruded or quenelled into water or broth at this temperature, the outside sets almost instantly. Heat setting is the basis for Wylie Dufresne’s famous shrimp noodle dish. Dufresne mixes pure shrimp paste and salt with 1% Activa RM and squeezes the mixture directly from a Japanese noodle press into a water bath at 54.4°C (130°F), where it instantly sets into starch-less noodles. Any TG product can be set this way, although for food safety reasons choose a temperature below 54.4°C (130°F). Thin products will completely set in a few minutes; thicker products take longer. After setting, finish the product to its desired final cooking temperature. An immersion circulator is the best tool for this job, but pots of water on the stove will suffice in a pinch. The temperatures necessary for heat-setting TG will eventually inactivate the enzyme. Fortunately, the reaction is largely complete before the enzyme is destroyed. At 50°C (122°F) the enzyme loses a third of its potency after 10 minutes. At 60°C (140°F), it loses 94% of its activity after 10 minutes.